Wow, what a summer we’ve had so far. Every year I’m astounded by the generosity of complete strangers who find this website and have the heart to either donate pens or bring them on their African journeys, but this year may take the cake! 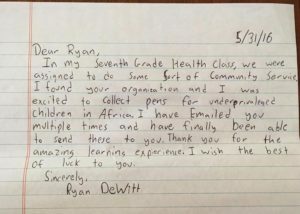 I recently received an inspiring letter from 7th-grader Ryan DeWitt of Fairfield, CT expressing his gratitude for our mission alongside 275 pens he helped collect at his middle school (see below). 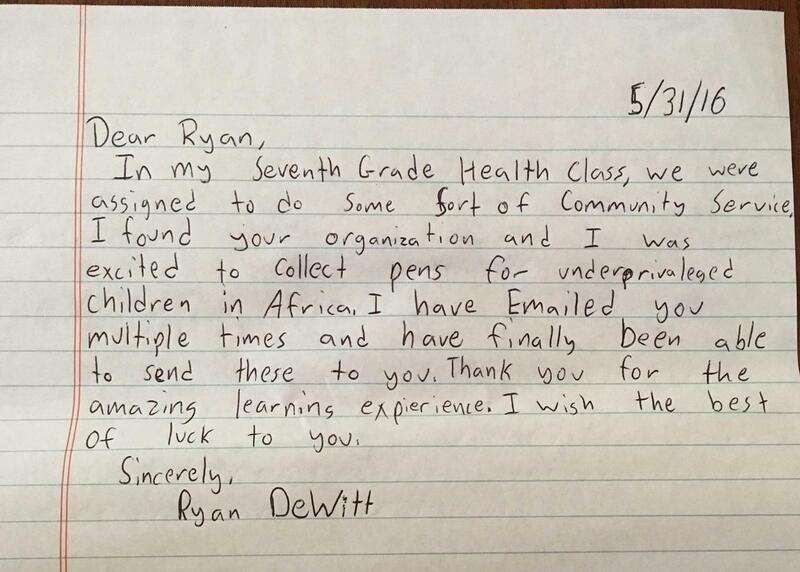 So first and foremost, a gigantic thank you to Ryan and his peers at Fairfield Woods Middle School in Fairfield, CT! In other news, we’ve extended our strong partnership with Putney Student Travel to their community service program in Tanzania this summer, which just kicked off and will distribute 200 pens to schoolchildren in some of the most remote and impoverished areas of the country over the next month. 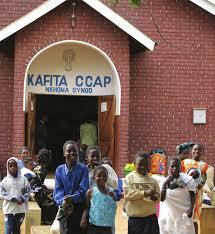 More info about their trip can be found here. Lastly, Pens To People has developed an exciting new partnership with Piedmont Community Church in Piedmont, CA, whose members have spent the last several years building and organizing a school in rural Malawi to spread the gift of education. Pens To People has provided an initial donation of 300 pens to be distributed to the children attending this new school and we look forward to providing more educational supplies in the near future for this young program. That’s all for now! As always, if you or someone you know will be traveling to a remote area of Africa that is short on educational supplies like pens, please refer them to Pens To People for pen collection/distribution materials and guidance. Enjoy the rest of your summer and stay tuned!